Calls have been made for a uniform burial charge across Northern Ireland, after research by Detail Data found a regional disparity of almost £3,000 in the price of a council grave. The cost ranges from £261 to £3,116 – this is just the cost of purchasing the grave and opening it for an adult burial. It does not include expenses such as the coffin, headstone and maintenance of the plot etc. 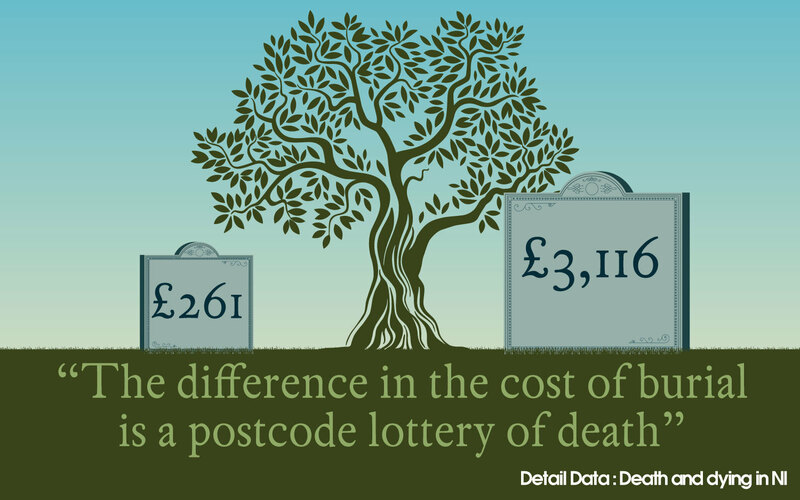 The postcode lottery means grieving families living in Moira would have to pay £843 for burial in a new grave in their local council cemetery whereas in Enniskillen the cost is currently £261. 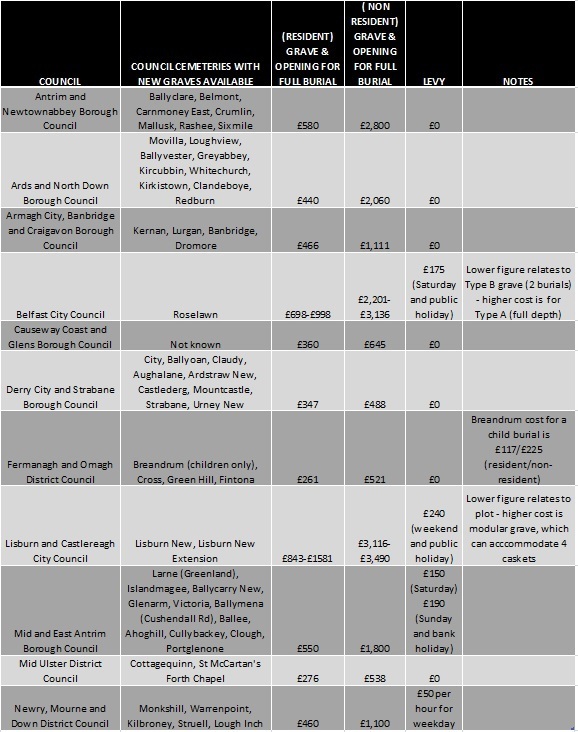 However, because of the two-tier pricing structure operated by Northern Ireland’s 11 councils – the fee for people living outside the council area is significantly higher. The least expensive ‘non-resident ‘ fee of £488 for burial in a new grave is levied by Derry and Strabane City Council rising to £3,116 in Lisburn and Castlereagh City Council. The table below shows the significant difference in 2017/18 fees across Northern Ireland for residents/non-residents. Reasons people could be hit with the ‘non-resident’ fee include that their closest council graveyard could be outside their resident council area, a result of grave shortages in their own area or that they choose to be buried in a family plot. Charities Citizens Advice and Marie Curie, which gives care and support to people living with any terminal illness and their families, have both voiced concern that the varying fees could plunge struggling families into greater debt simply because of their postcode. 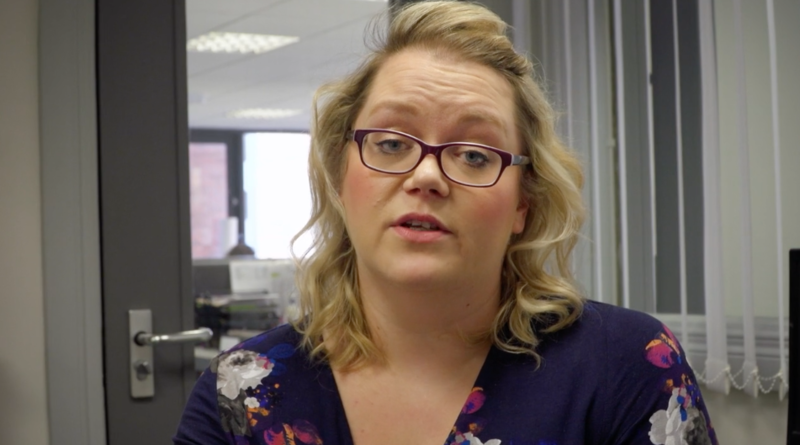 Sarah McCully Russell, information and policy officer for Citizens Advice, said: “The difference in the cost of burials is a postcode lottery of death. Depending on where you live depends on how much you are going to have to pay, that is inherently unfair. Those sentiments were echoed by Marie Curie’s Joan McEwan, who said: “We would like to see a clear and uniform price across Northern Ireland so that there is not a disparity between council areas. When you take into consideration additional costs including coffin, flowers, funeral service, hearse, death notices, order of service, catering, surrounds for the grave, headstones, legal fees, total funeral costs could run into thousands of pounds. Sunlife’s annual Cost of Dying report puts the UK average cost of dying at just under £9,000. A shortage of available land is one of the main reasons for the regional cost differences, according to the representative body for the 11 councils. In response to Freedom of Information requests we submitted to the 11 councils, an analysis of the data found 54 of the 116 open council cemeteries have new graves available. In total there were less than 47,000 graves listed as being available as of January 2017. Three councils did not know the number of new graves available. Each year there are around 6,800 burials in council cemeteries, according to the figures provided, which would indicate around 44% of people in Northern Ireland opt to be buried in a local authority cemetery. It is difficult to get exact figures for the availability of graves into the future as it is dependent on the ground conditions. The three main churches – the Roman Catholic, Church of Ireland and Presbyterian – were unable to provide figures for the cost of burials in church graveyards as these are decided at a local level. A spokesman for the Jewish community, Dr Leslie Leopold, said it has one open graveyard (Carnmoney) where a grave costs £2,000. Figures we received from the 11 local councils also revealed that over three years up to 2016, 15 people died without having the money or a family who were unable or unwilling to pay for their burial. The arrangements and cost for their burials, known as public health funerals, were made by their local councils. Newry and Mourne Council told Detail Data that it carried out two public health funerals in 2015 at a cost of £3,000 and one in 2016, which cost £1,650 – approximately £600 more than the average Funeral Payment benefit provided to people on low incomes. Northern Ireland’s only crematorium – Belfast City Crematorium at Roselawn - carried out more than 3,000 cremations in 2016 and more than half were for people living outside Belfast City Council area. According to the National Association of Funeral Directors, which represents over 85% of funeral homes here, Northern Ireland is the only region in the UK where cremation typically costs more than burial. Of the 6,529 cremations in 2015 and 2016, 3,792 (58%) were for non-residents. Fees for non-Belfast residents cost £610 compared to £370 for resident adults and that includes the disposal of cremated remains packed for collection, scattered or buried in Roselawn’s Garden of Remembrance. But data received under FOI shows of 1,915 non-resident cremations in 2015 just 92 opted for scattering in the Garden of Remembrance and 33 for burial. Therefore, on top of the £610 cremation fee, families potentially faced additional charges for burial of ashes elsewhere. Approximately 20% of people who died in Northern Ireland in 2015 opted for cremation – although not every one of the 3,210 cremations may have been Northern Ireland residents. However, the figures are similar to those provided by some of the councils including Ards and North Down Borough Council which carried out 888 full burials in 2015 and 172 ashes burials (16%).